That’s really all the sandwich theorem is. Let’s look at a mathematical example. Well, we know that if the limit of each function exists, then the limit of a product of functions is equal to the product of the limits. However, the limit as x tends to 0 of doesn’t exist. This is because as , and the sine function fluctuates as its argument gets bigger and bigger. Thus we can’t use the limit laws to work out this limit. In this example we had to be particularly careful because in the product of functions, the one which was well behaved (ie. whose limits we knew) changed sign, and so we had to split things up as the inequalities swapped around. It won’t always be the case that you have to split it into the two separate limits. For instance, had it been then it would have been slightly easier. Visually we can see what is going on by looking at the graphs of (green), (red) and (blue) (at least for positive ). 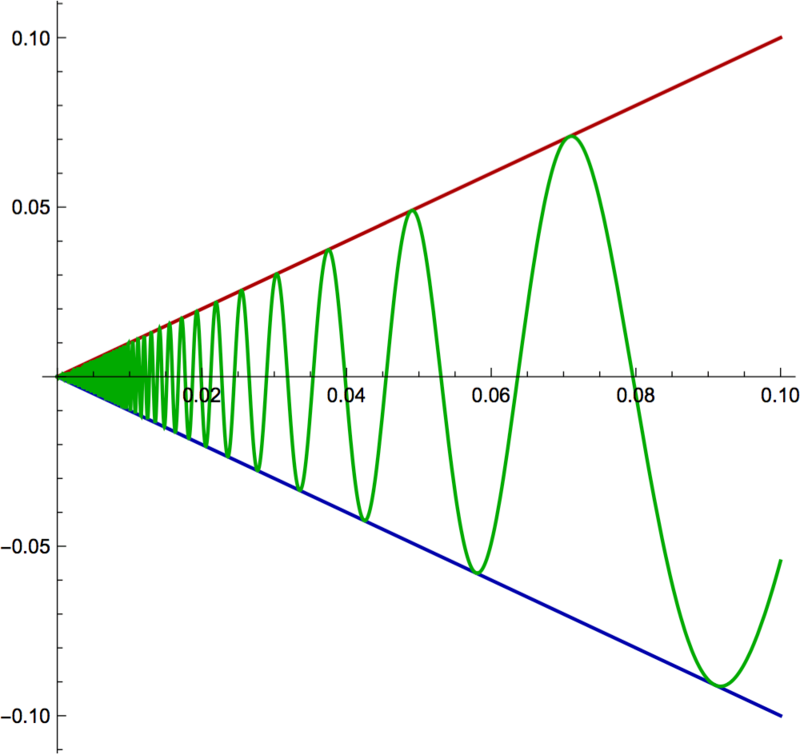 You can see that while the function we are interested in is going crazy as , you can be sure that it is between the red and blue lines, and thus, as we take x to zero, if the red and blue lines converge, then the green line will tend to whatever the red and blue lines are converging to. In this case it’s 0. What if we wanted to know ? Well, do we need to use the squeeze theorem? No, not at all, in this case the limit of both parts of the product exist and we end up with . We use the squeeze theorem when we have a product of functions where one of the functions doesn’t have a limit at the place we’re interested, but we can say that it is always between two other functions, who tend to the same thing in the limit of interest. We have to take this on a case by case basis. This looks much much harder! How on Earth are we going to be able to figure out what the appropriate functions to sandwich this function in between will be? Well, the point is that we just want to ask about the behaviour for large x. Performing the same exercise with the function on the right, you will find exactly the same answer. So we can see that as , the function that we are interested in is between 7 and 7. Well, that makes it pretty certain that it must also be 7. We thus use this theorem if we have a function g(x) whose limit we don’t know, but we can find two other functions f(x) and h(x) which it is sandwiched in between. We find them by inspecting g(x) and working out if some part of it will always be constrained to be within some particular range of values (like sin is). Hi Zuzumusa, this is so that we can calculate the limit. as x->infinity, both the numerator and the denominator go to infinity. By multiplying top and bottom by 1/x^4 we can find the limit.